Kevin J. Fleming, Ph.D. is President & CEO of Grey Matters International, Inc., an international neuroleadership consultancy and coaching firm. He is also the founder of “Assumptive Coaching,” an integrative model aimed at challenging the thinking underneath one’s thinking about change and the complex systems inherent in decision-making. Utilizing alignment principles of human nature, virtues/ethics, and working with the ways of the brain, he is in the practice of moving individuals, partnerships, families and teams away from rote behavior toward areas of creativity and shared accomplishment. 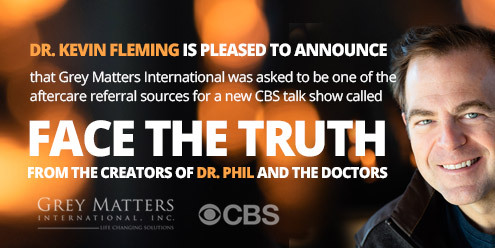 Dr. Fleming brings to his work a unique and comprehensive professional background. He has been recognized, and collaborated with, such diverse persons and groups as Deepak Chopra, Dupree Miller (literary agency for Dr. Phil and Joel Osteen), the NFL, Eric Clapton’s “Crossroads Antigua” Treatment Center, Sierra Tucson Treatment Center, White House Cabinet Members and many more (please see below). Dr. Fleming is an active member of the World Business Academy, Institute for Executive Development, and the American Society of Training & Development. His book (The Half-Truth High: Breaking the Illusions of the Most Powerful Drug in Life & Business) is released and available on amazon.com. It features a foreword by NY Times bestselling author Tom Morris. This book has received noteworthy praise from Patch Adams (from the blockbuster Hollywood film starring the late Robin Williams), Harvard Business School Emeritus Professor Gerald Zaltman, as well as Dr. Joe Dispenza, featured scientist in the hit underground movie, What The Bleep Do We Know? While “Doc” (as he is often called) often visits all corners of the world to meet with dignitaries, actors, athletes, politicians, or executives., he and his staff bring an unwavering commitment to “being present” wherever their work takes them, helping struggling individuals persevere into achieving a whole new level of mental health. Can we really have everything we want, 100 percent of the time in this life? What do we do when we are faced with changing something about who we are and the immediacy of our desires are blocked at the same time? Dr. Fleming shares some insights about the fundamental nature of the ‘trade off”. President/CEO/Owner, Grey Matters International, Inc. Member of the Advisory Board for Mental Training, Inc. Member of the Association for Applied Psychophysiology and Biofeedback, Inc.
Book Your Appointment with Dr. Fleming Now! Please Leave Dr. Fleming Your Preferred Time. You Will Receive A Confirmation Email With The Details Of Your Session. Check out his version of Bruce Cockburn's "Closer To The Light"
For better or for worse: is marriage counseling worth it? © 2019 GREY MATTERS INTERNATIONAL INC. ALL RIGHTS RESERVED.